Everglide is an integrated solution for short distance travel and personal effects management. The product operates as an infill mode of transport that seamlessly assimilates with other forms of public transport such as buses and trains, thereby promoting sustainable mobility habits. 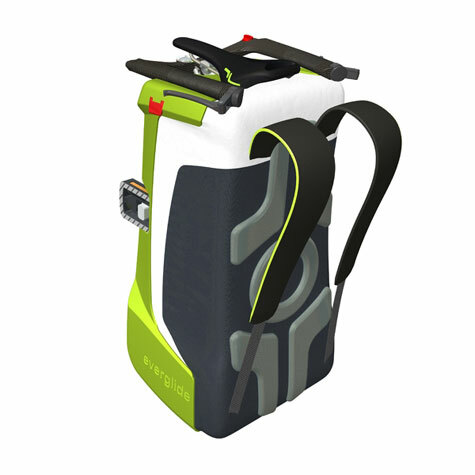 Everglide has been designed as an active based device with three key functional attributes; having the ability to be wheeled, backpacked or cycled. The design houses a shaft drive mechanism which is light weight clean and compact. Hand held devices such as phones and ipod’s are able to be plugged in and regeneratively charged via frictionless magnetic dynamo technology. 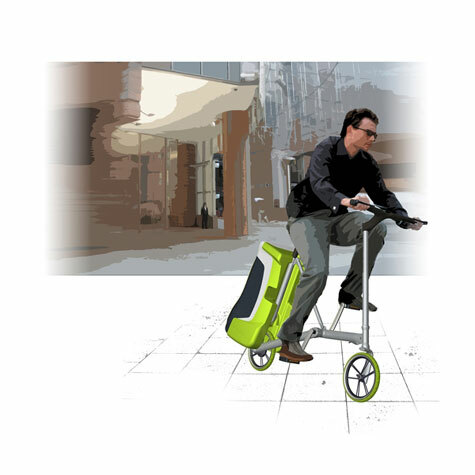 Everglide is a personal mobility device representing a holistic and sustainable approach to individual transportation. It exhibits innovation by integrating time, speed and storage-based mobility issues into one lightweight mobile unit. There is increasing global debate on issues, such as, peak oil, mobility choice, traffic congestion and urban density; these factors have led to a shifting mentality towards alternative mobility solutions. If immediate attention and improvements are not focused on mobility issues from a number of platforms, our cities will suffer economically, environmentally and socially. Modern Cities are changing; similarly the way people move around should change. Therefore, the next generation of products must be smarter and more environmentally responsible to meet the real needs of society. 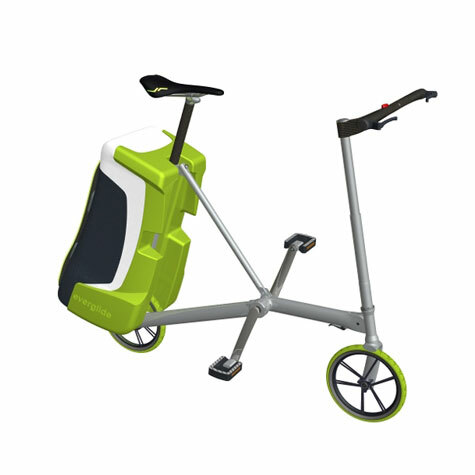 Everglide identifies a missing link in people’s movement habits, and is consequently designed for the ‘last-mile’ – the short distance; between home public transport and the end destination – integrating transport and carrying-ability. There is an intrinsic and inseparable link between personal-transport (getting yourself around) and personal-effects-management (getting your belongings around with you. Everglide is purposefully designed as an active-based device promoting physical activity and operates as an infill-mode of transport that seamlessly assimilates with other forms of transport such as buses and trains. Everglide acts as a complementary or stand-alone transport mode, thus promoting flexible alternatives to private car journeys. Everglide has three distinct functional modes: the ability to be cycled (pack is attached/ backpacked), wheeled like airport luggage, or backpacked (with or without the cycle). Similarly its strong product language clearly communicates its function. 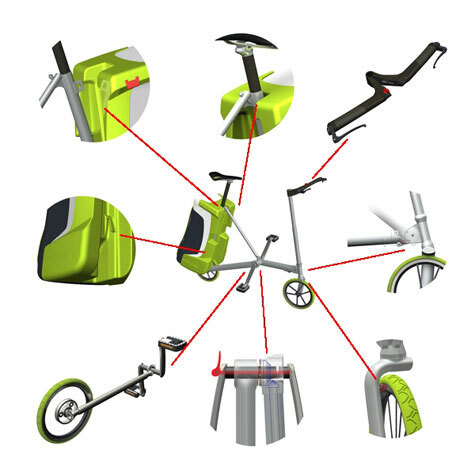 The rationale for this solution set is that it combines the widest set of personal-mobility options with the widest set of personal-effects-management options, being compact enough to cohabit with other users in populated environments. This holistic integration of mobility-and-storage makes Everglide a pioneering product. Everglide’s design is intelligent and practical, particularly through its innovative collapsing central bottom bracket. Releasing the central locking lever simultaneously effects three actions: the frame splits so that the bicycle folds, the shaft-drive gears disengage so that it can freewheel; the pedals disengage folding into the pack. The shaft-drive mechanism is light-weight and compact, making it a clean smart drive solution. This design complies with the current standards in place for vehicles of this nature. Everglide is also designed to fit the human form in all of its various formats. The visual form and product language of this design is based on research into the prospective consumer profile. The product would connect with educated, socially aware people that are known to be ‘time-poor’ and ‘tech-savvy’. Hand held devices such as phones and ipod’s are able to be plugged-in and regeneratively charged with the added technology of a frictionless magnetic dynamo. Everglide employs current manufacturing methods such as bonded and lugged technology. High Quality materials are used such as 7005 series aluminium and carbon fibre ensures the longevity of the product whilst also maintain its necessary light weight. Everglide therefore, offers a multifunctional and flexible concept that is able to adapt to different environments and user needs.